My site has been pretty dead as of late. However, it’s for a pretty damn good reason (well, depending on who you ask): I got married. Two years ago in November, I asked my fiancée to marry me and she was foolish enough to say yes. 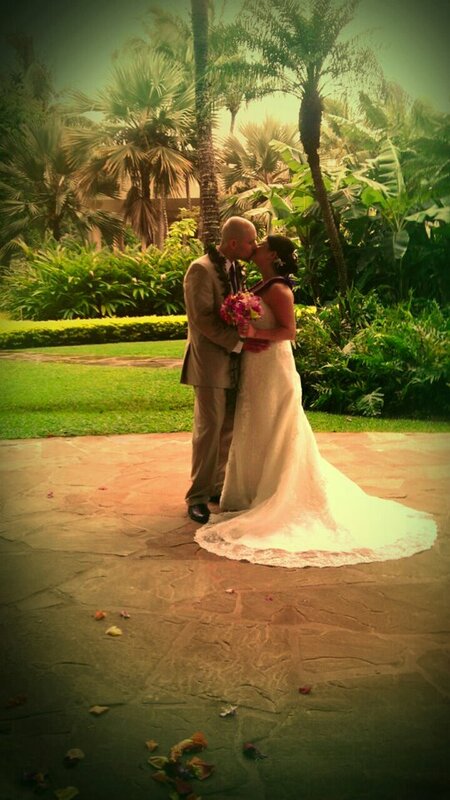 When we couldn’t decide to get married in Michigan, where I am from, or Arizona, where she is from, we decided on somewhere completely different: Kauai in Hawaii. We couldn’t invite a lot of people but we were very fortunate that so many people were able to come and join us. On Sunday, March 11th Erin and I were joined in what I’m assured was an official ceremony (as long as our marriage does not run for President). It was raining on the day of the wedding but as you can see from the picture, things were still beautiful. Afterwards, we stayed in Kauai for our honeymoon and had a fantastic time there. We stayed at the fanciest hotel either of us have ever been to (the Princeville St Regis), hiked down to a natural ocean pool (that many people have died trying to swim in), went on a boat and plane tour, tried out paddle boarding and surfing, and just totally had a blast. If you’re thinking about going to Hawaii, I’d recommend Kauai (even though I haven’t been to the other islands yet). On the beer front, Kauai doesn’t really get a lot of craft beers imported. They do, however, have a few local breweries. Of particular note is the Coconut Porter from Maui Brewing Company and Hawaii Nui Brewing’s Hapa Ale. I’m not really sure if there is anywhere stateside that you can get these but if you have a chance, I’d recommend them. Deserving of an honorable mention was Kona Brewing Company’s Longboard Lager and Big Wave Golden Ale.